Sixth President of the University of Virginia. Photo courtesy of Special Collections. President and Mrs. O’Neil with their four children on the Carr’s Hill portico. From left to right: Robert and Karen O’Neil, with Ben, Peter, Liza, and David. Photo courtesy of University of Virginia Alumni Association Photo Archives. In 1990, the civil rights activist Rosa Parks visited the Grounds. Here President O’Neil stands at the podium with her. Photo courtesy of Special Collections. Ann Hereford died in 1997, and Frank Hereford in 2004. Together they had opened the doors of Carr’s Hill wide, welcoming students, faculty, and for the first time, many alumni, who with their contributions to the capital campaign, helped project the University into the upper ranks. When Mr. Hereford stepped down from office the University was beginning to fulfill Mr. Jefferson’s dream of it being a cosmopolitan center of teaching and research. 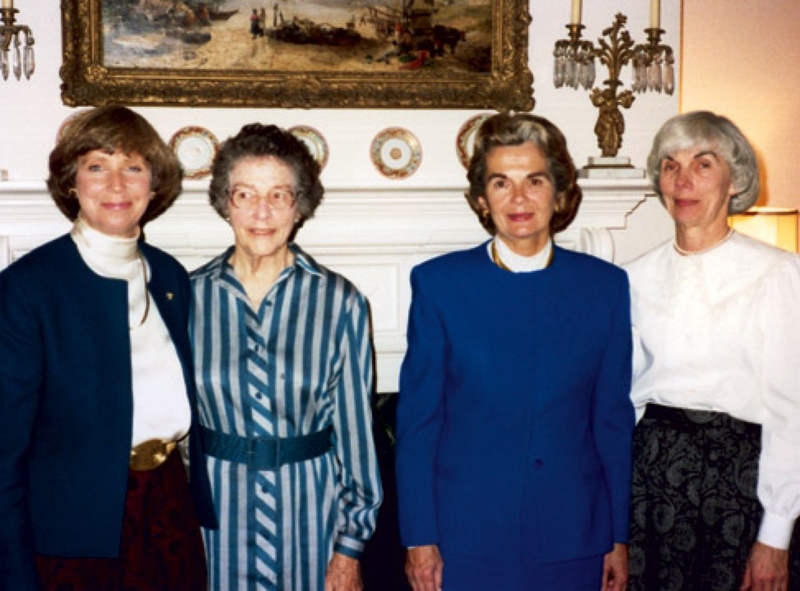 Former University of Virginia first ladies stand with then-current first lady Karen O’Neil in front of the Carr’s Hill living room fireplace, circa 1989. From left to right: Karen O’Neil, Constance Darden, Ann Hereford, and Eleanor Shannon. Photo courtesy of Karen O’Neil. With three degrees from Harvard, including a degree in law, and having been president of the statewide University of Wisconsin system, President O’Neil considered himself a real “outsider” at the University, unlike his immediate predecessors, Edgar Shannon and Frank Hereford, and his successor, John Casteen. Like the other outsider president, Edwin Alderman, he came to the University with a distinct set of goals, and the energy to achieve them. Improving student and faculty representation of African-Americans and faculty representation of women at the University was a particular area of concern in Robert O’Neil’s presidency. He became the University’s sixth president in 1985, and by 1987, the University had established the Holland Scholarships to attract African-American students. By 1989, the University’s Women’s Center had opened, as did a day care center for employees’ children. He established task forces to study the status of women and minorities at the University, and a task force to grapple with issues of student substance abuse. Over the years, many dignitaries have been guests of the University’s presidents. 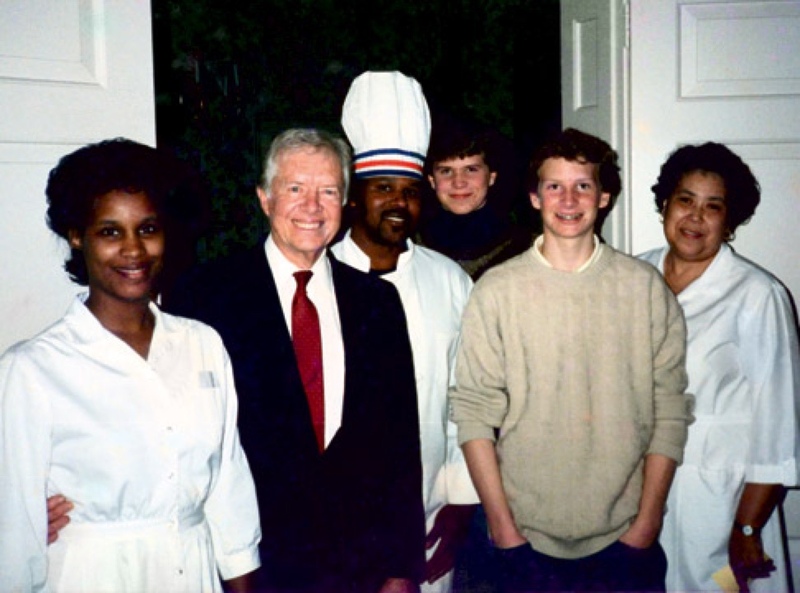 Here President Jimmy Carter stands with (from left to right) the Carr’s Hill housekeeper, Shelby Hawkins; Carr’s Hill cook, Reginald Scott; David and Peter O’Neil; and Carr’s Hill head housekeeper, Barbara Jett. Photo courtesy of Karen O’Neil. Mr. O’Neil developed at the University four new programs of study: biomedical ethics, environmental science, women’s studies, and Tibetan studies. He also established a new degree, a masters of teaching in the Curry School of Education. He promoted interdisciplinary studies in science, and a more international awareness across the University. During President O’Neil’s tenure, he welcomed ever increasing numbers of visitors to Carr’s Hill. Photo courtesy of University of Virginia Alumni Association Photo Archives. 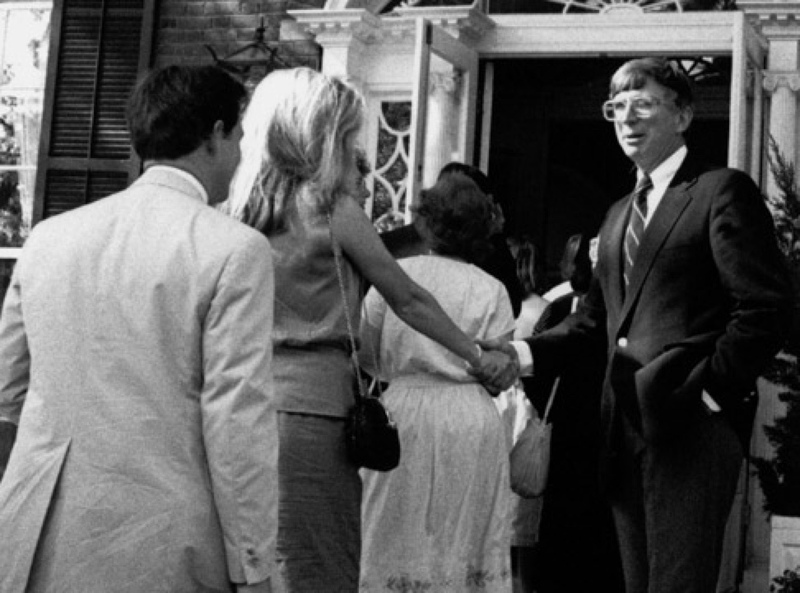 When in 1990 President O’Neil stepped down from office, the University, known widely as a “public Ivy,” was receiving more applications than ever. Out of 17,000 applicants for undergraduate admission, the University accepted 2,560. And the Law School had 6,000 applicants from whom to choose 380 first-year students. In five years he had made a mark that was significant and long-lasting. Like the presidents before him, he had opened the University’s gates a bit wider to the world.